The AMI series from Wall Industries, Inc. is highly suitable for high speed pick and place machine operation. The operating temperature range of –40°C to +85°C is ideal for designers needing industrial temperature operation. 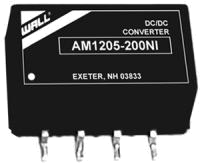 This series has 3.3, 5, 9, 12, and 15VDC single output voltages available. This series is RoHS compliant. Short Circuit Protection: 1 sec. Dimensions: 0.5in. × 0.3in. × 0.25in. Notes: 1. The efficiency will increase with an increase in the input voltage.